Waterford, VT: Bernadine Mae Belknap, age 80, of Hudson Road, passed away at her home, Friday night, January 11, 2019, following a brief decline in health. Bernadine was born in St. Johnsbury, VT, on March 2, 1938, daughter to the late Calvin Augustus and Iola Lucy (Widger) Harbaugh. She grew up in St. Johnsbury where she attended school and graduated from St. Johnsbury Academy in the Class of 1956. For 24 years Bernadine worked at the Academy where she was in charge of the bookroom, inventories and also proctored study halls. Bernadine was considered a second mother to a number of students at St. Johnsbury Academy. Bernadine also worked at the Rabbit Hill Inn as well as the Fitch Clinic. 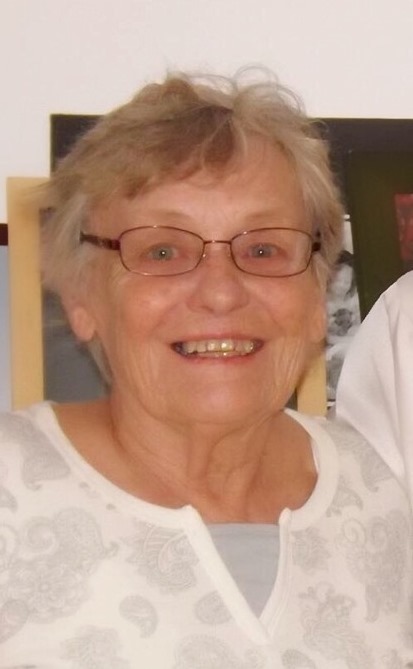 She loved camping, going to the races with her husband Paul, and attending family sporting events, especially the softball and basketball games of her grandchildren. She spent hours coaching basketball and was very involved in the basketball program at Waterford School. Bernadine was a past member of Grace United Methodist Church and of the VFW Ladies Auxiliary. Bernie’s kind heart and ability to bring a smile to anyone’s face will be remembered forever. She is survived by her two sons: Eric Belknap and wife, Felicia, of Waterford, VT, and Calvin Belknap and wife, Alisa, of Arden, NC; 3 sisters: Fredricka Stebelus of St. Johnsbury, Jeanette Libby and husband, Clinton, of Lyndonville, Marion Veilleux and husband, Robert, of St. Johnsbury; 6 grandchildren: Morgan Belknap, T.J. Shaw, Taylor Johnson, and Lauren, Kristen, and Taylor Belknap; many nieces and nephews, and her beloved Shih Tzu: General Lee. She was predeceased by her husband of 52 years, Paul Belknap, on February 20, 2018; her son: Jeffrey C. Belknap in 2015; her brother: Russell Harbaugh in 2017; and sister: Ruth Carroll in 2016. The family of Bernadine would like to extend a special thank you to a dear friend and caregiver, Sarah Wescott. With Sarah’s efforts a warm smile could always be found on the faces of Bernadine and Paul. A Graveside Service will take place in the summer at 11AM on Friday June 21, 2019 at the Mt. Pleasant Cemetery in St. Johnsbury. There's still time to send flowers to the Graveside Service at the Mt. Pleasant Cemetery at 11:00 AM on June 21, 2019.